The Beverage Battles are one of my ongoing parenting challenges. We started many years ago by watering down the juice, carefully monitoring when to switch from whole to 2% milk, and entirely banning “punch” drinks. Even now the madness continues – we spend a lot of energy monitoring their fluids. Which is 180 degrees from prior generations. I vividly remember being 8 or 9 and "drinking" mysterious, dark liquid from tiny wax bottles. You know, the ones that we had chewed the top off of. Literally, we gnawed on something like a soft candle, spit out the wax, and slurped the ooze inside. And nobody batted an eye. But when my turn came, I wouldn't let Doodle Bug (now known as Teen Spirit) within a mile of soda, Public Frenemy #1. He was probably close to 8 years old when he first tasted a sip of ginger ale. We literally used to carry a gallon of milk us everywhere. He guzzled it and we didn't want to moo-ch off our friends constantly. He wanted milk so much that we were always in anticipation of some dairy emergency. Of course, all that vigilance has its price. By the time La Principessa exploded on the scene, we were growing weary of guarding the bar. A few more sleep-deprived nights and I might have just handed her a scotch on the rocks. But then the sound of her clinking ice in a glass to summon me would have just been annoying. One of La Principessa's faves is V-8, known to me as V-H8. I can't stand the smell of it, never mind a big tomato-y swig. Daddy-o will chug it with Clamato just to watch the beads of nausea-induced sweat erupt on my forehead. At least it’s good for her. Might balance if I do decide to let her have a few sodas here and there. That's a distinct possibility because I soon might need to take out a second mortgage just to keep the two of them in Odwalla tropical fruit protein smoothies. Anyway, Teen Spirit is a long way from his Doodle Bug Moo Juice days and I’m paying the price for demonizing Coke and Pepsi. 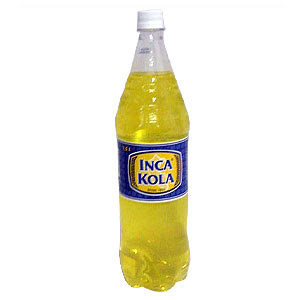 His current favorite is the Peruvian soda, Inca Cola. For a while, wherever you looked, there was a glass of it in the house. I’m sure it’s part pride in his heritage and part teen recklessness. Or wretchedness. 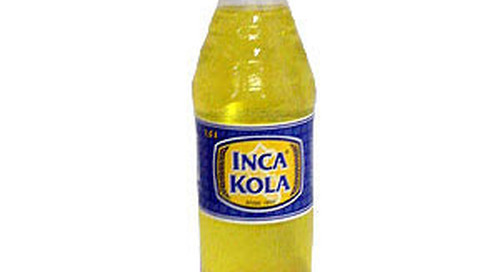 Because – no offense to my friends to the south - I swear on Lake Titicaca that Inca Cola is an, hmmm, acquired taste. Acquired, like if you had never acquired taste buds. If you’ve never before had the pleasure, this yellowy concoction is a cross between bubblegum, Mountain Dew and Cream Soda. To me it’s more reminiscent of colonoscopy prep liquid. And its bright yellow shade often confuses folks into mistaking it for a urine sample. Peruvian Pee-psi. I suppose I shouldn’t complain – he could be overloading on Monster or Red Bull. Or beer. When you look at it that way, I guess a little Tinkle Cola is not so hard to swallow.